Lovell Cabbil (6'3''-G) scored 20 points with a near-perfect shooting day and Liberty coasted to its seventh-straight win Monday night, defeating North Alabama 72-47. Cabil was 5 of 6 from the field and 8 of 9 from the foul line. 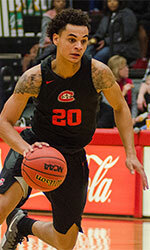 Caleb Homesley (6'4''-G) added 15 points on 6-of-9 shooting, including three 3s, and grabbed nine rebounds for the Flames (17-4, 6-0 Atlantic Sun), who have never started a conference season 6-0. Both teams struggled shooting in the first half when Liberty took a 26-19 lead. But the Flames made their first eight shots of the second half, taking a 46-27 lead on a jumper by Scottie James (6'7''-F-96). Liberty went 14 of 19 with four 3-pointers in the second half - with all of its misses from 3-point range. Surprisingly, James, who is shooting 70.5 per cent, putting him on track to break national record (63.9), was just 3 of 8. Cabbil had 17 points in the second half. For good measure Liberty went 20 of 24 from the foul line. Jamari Blackmon (6'0''-PG-00) and Christian Agnew (6'2''-G-99) had 13 points apiece for the Lions (7-14, 4-2). We bring you last week's top former Roadrunners players who are currently playing in pro basketball. #1. Brandon Jefferson (5'9''-PG-91, graduated '14, plays pro in France) led Entente Orleans 45 to a victory over the 15th-ranked ALM Evreux (10-18) 86-76 in the French ProB (second division) on Tuesday night. He was MVP of the game. Jefferson recorded 26 points (!!! ), 4 rebounds, 7 assists and 3 steals (made all of his ten free throws !!!) in 37 minutes. Entente Orleans 45 (20-8) is placed third in the ProB. Jefferson has individually a very good season with high stats. He averages 16.1ppg, 2.9rpg, 5.6apg and 1.2spg. #2. Nick Kay (6'9''-F/C-92, graduated '15, plays in New Zealand) was the major contributor in a Wellington Saints' victory against the sixth-ranked Huskies (1-2) crushing them 87-60 in the New Zealand NBL in Friday night's game. He scored 20 points and grabbed 8 rebounds. Wellington Saints (3-0) are placed first in the NBL. So far his team won all three games in the Regular Season. But this is still an early stage of the season and everything may happen. Kay has very impressive stats this year 20.3ppg, 8.7rpg and 3.7apg in three games he played so far. #3. 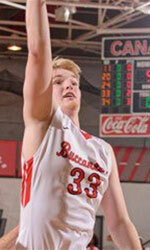 Mitchell McCarron (6'3''-G-92, graduated '15, currently in New Zealand) was the main contributor in a SIT Zero Fees Southland Sharks' victory against the closely-ranked Giants (1-1) 100-91 in the New Zealand NBL last Thursday. He was MVP of the game. McCarron scored 20 points and grabbed 5 rebounds in 31 minutes. SIT Zero Fees Southland Sharks (2-1) are placed second in the NBL. But the season just started, so everything may happen. This year McCarron has very high stats. He averages 16.3ppg, 6.3rpg and 4.0apg. #4. Experienced Benjamin Ortner (6'9''-C/F-83, graduated '05, plays pro in Italy). Ortner could not help Grissin Bon Reggio Emilia (7-20) to beat Virtus Bologna (13-14) in the Italian Serie A. He scored 8 points and grabbed 4 rebounds. Grissin Bon Reggio Emilia lost 81-89 on the road to the higher-ranked (#11) Virtus Bologna. It was Grissin Bon Reggio Emilia's third consecutive loss in a row. There are only three games left until the end of the Regular Season. So now every game will be critical. It's Ortner's first season with the team. This year Ortner averages 5.0ppg and 3.1rpg in 21 games. #5. Cameron Williams (6'1''-G-95, graduated '18, plays in Australia) was not able to help East Perth Eagles (4-12) in their game last Thursday. Despite his very good performance his team were defeated 94-80 in Kalamunda by the much lower-ranked Suns (#8) in the SBL group. Williams was the top scorer with 27 points. He also added 4 boards, handed out 6 passes and blocked 3 shots in 34 minutes. But the season is still in it's first stage and everything can happen. This season Williams has very high stats. He averages 19.7ppg, 3.9rpg, 4.0apg and 2.7spg. #6. Drew Williamson (6'5''-G/F-83, graduated '06, currently in Australia) is a teammate of previously mentioned Cameron Williams and both played together in the last Australian State League game. Williamson, who plays in the Australian State League (second division) was not able to secure a victory for East Perth Eagles (4-12) in their last game. Despite his good performance his team lost 80-94 in Kalamunda to the much lower-ranked (#8) Suns in the SBL group. Williamson scored 10 points, grabbed 4 boards, handed out 3 passes and blocked 3 shots. Williamson has relatively good stats this year 11.5ppg, 4.5rpg, 2.3apg and 1.6spg in eight games. We bring you last week's top former Wolves players who are currently playing in pro basketball. #1. Gavin Field (6'8''-F/G-89, graduated '12, plays pro in Australia) led Cockburn Cougars to a victory over the second-ranked Lightning (5-1) 102-88 in the Australian State League (second division) on Thursday night. He was MVP of the game. Field scored 32 points (!!! ), made 8 passes and 4 steals in 36 minutes. It was the game of the round between two top 3 ranked teams in group SBL. Cockburn Cougars (9-9) are placed . But this is still an early stage of the season and everything may happen. It's Field's sixth year with the team. He has individually a very good season with high stats. Field averages 23.4ppg, 8.3rpg, 4.4apg, 1.4bpg and 2.6spg. #2. Alexander Abreu (5'11''-PG-91, graduated '15, plays in Puerto Rico) could not help Santeros de Aguada (13-8) in their last game. Despite his very good performance the league leader Santeros de Aguada lost 81-94 on the road to the second-ranked Piratas. Abreu was the top scorer with 19 points. He also added 5 passes (was perfect 5-for-5 from the free throw line). This year Abreu averages 8.8ppg, 2.2rpg and 5.9apg in 21 games he played so far. #3. Ryan Godfrey (6'2''-G-90, graduated '14, currently in Australia) contributed to a Rockingham Flames' victory against the leader Wanneroo (6-1) 98-92 in the Australian State League (second division) last Thursday. He scored 10 points, made 5 passes and 7 steals in 29 minutes. It was the game of the round between two top 3 ranked teams in group SBL. Rockingham Flames (5-2) are placed third. It was his team's third consecutive victory in a row. But the season just started, so everything may happen. It's Godfrey's fifth year with the team. This season Godfrey has very high stats. He averages 15.2ppg, 3.2rpg, 6.3apg, 1.5bpg and 3.2spg. #4. Ovie Magbegor (6'5''-F, graduated '18, plays pro in Australia) was not able to help Eltham Wildcats in their game against Geelong Supercats (3-2) in the Australian State League (second division). Magbegor's contribution was not very remarkable in Saturday's game. He scored only 2 points and grabbed 4 rebounds. The ninth-placed Eltham Wildcats (2-2) were crushed 103-72 in Geelong by the higher-ranked (#7) Supercats in the NBL1 group. But the season is still in it's first stage and everything can happen. This year Magbegor averages 2.7ppg and 3.7rpg in three games. #5. Deonta Stocks (6'1''-G-88, graduated '15, plays in Brazil) was the major contributor in a Sao Paulo FC's victory against the league outsider Blumenau (3-10) 82-71 in the Brazilian Liga Ouro (second division) in Tuesday night's game. He scored 18 points, made 5 passes and 7 steals (was perfect 5-for-5 from the free throw line) in 32 minutes. Sao Paulo FC (8-5) is placed third in the Liga Ouro. Stocks' team will play only one more game in the Regular Season. And that game will be critical. Stocks has relatively good stats this season 14.9ppg, 2.6rpg, 4.0apg and 2.5spg. Here is the weekly review of the top performing Crimson Hawks alumni, who are currently playing in pro basketball. #1. Anthony Glover Jr. (6'1''-G-96, graduated '18, plays pro in Mexico) led Pioneros de Los Mochis to a 2-point victory over the closely-ranked Rayos de Hermosillo (6-6) 86-84 in the Mexican CIBACOPA in Wednesday night's game. Glover Jr. was MVP of the game. He recorded 21 points, 9 rebounds and 6 assists in 34 minutes; quite an impressive performance considering it's only Glover Jr.'s first season in pro basketball. Pioneros de Los Mochis (3-8) is located at the very bottom in the CIBACOPA. But this is still an early stage of the season and everything may happen. Glover Jr. has individually a very good year with high stats. He averages 21.7ppg, 4.7rpg and 3.2apg in 11 games he played so far. Worth to mention he played also at Eurobasket Summer League, which helped him get the job in pro basketball. #2. Mathis Keita (6'4''-G-92, graduated '14, plays in France) contributed to an easy victory against the 15th-ranked ALM Evreux (10-18) 94-78 in the French ProB (second division) last Friday. He scored 9 points, had 4 rebounds and dished 7 assists. Chorale de Roanne Basket (22-5) is placed first in the ProB. It was his team's seventh consecutive victory in a row. This season Keita averages 8.9ppg, 3.0rpg and 5.1apg. #3. Marcel Souberbielle (6'7''-F-91, graduated '13, currently in Uruguay), who plays in the Uruguayan LUB could not help Malvin (4-1) to beat Urunday Universitario (2-3). He scored 5 points in 26 minutes. The first-placed Malvin (4-1) lost 73-79 in a derby game to the lower-ranked (#5) Urunday Universitario in the Places 1-6 group. It was Malvin's first loss after eight consecutive victories. It's Souberbielle's first season with the team. This year Souberbielle averages 8.9ppg, 3.7rpg and 1.6apg in 27 games. #4. Ashton Smith (6'2''-G-89, graduated '12, plays pro in Canada) was not able to help the Kitchener-Waterloo Titans (19-21) in their last game on Monday. Despite his very good performance the Kitchener-Waterloo Titans (#4) were edged 112-111 on the road by the St. John's Edge. Smith was the top scorer with 25 points. He also added 8 rebounds and dished 4 assists. It's Smith's first season with the team. Smith has relatively good stats this year 13.7ppg, 4.2rpg, 5.4apg and 1.2spg. Notice: The list above includes only some of the Indiana University of Pennsylvania alumni playing currently in pro basketball. Check COMPLETE LIST.